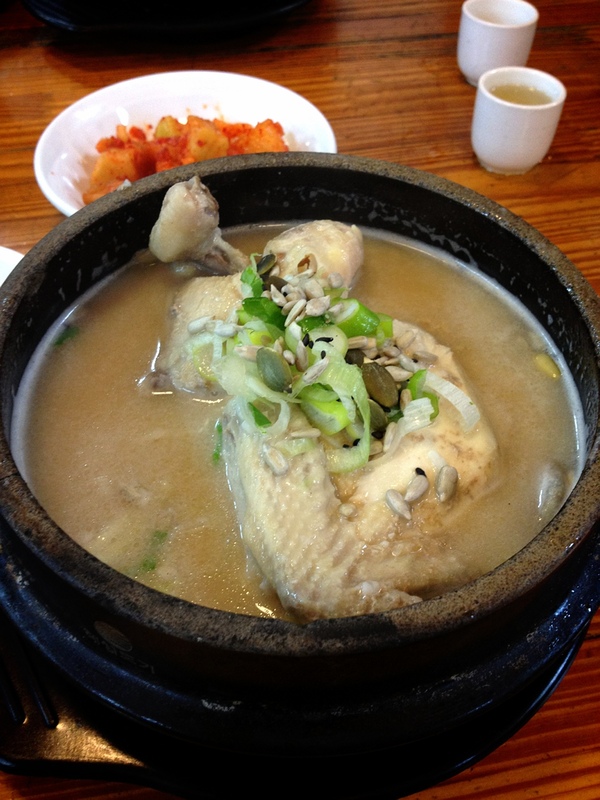 Samgyetang (pronounced SAM-gaye-tang) is a traditional Korean dish that basically consists of a whole young chicken, stuffed with sweet rice and ginseng, placed in a stone hot pot and boiled into a soup. 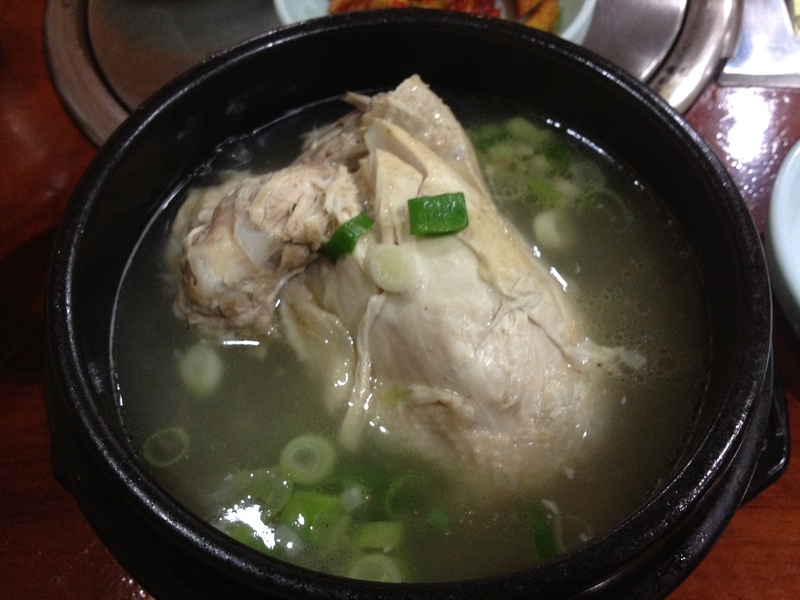 It is considered to be the ultimate “hot food” because it has both chicken and ginseng, and the best weapon against the sweltering heat of summer. 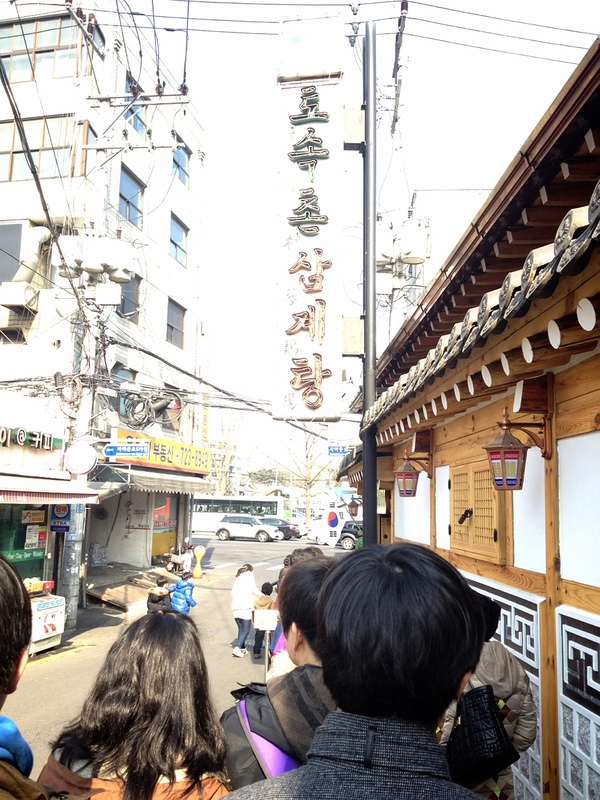 And in Seoul, you can’t talk about samgyetang without talking about the most famous place to get it: To-Sok-Chon. First, let me tell you: the line is deceptively long. The staff has been dealing with huge crowds for a long time and are quite efficient about getting everyone in and out as quickly as possible. Unless it’s some crazy holiday, the line moves pretty quickly and you will be seated in no time. As with all true specialty restaurants, the menu is limited. There are other items, but it doesn’t matter because you’re there for the samgyetang. The meal begins with that small glass you see in the right corner of the photo. That is ginseng liquor, and it’s meant to warm your insides like whoa. Each of the tables have two urns filled with cabbage kimchi and radish kimchi, from which you are to serve yourself onto the individual dishes provided. Add salt and pepper to taste, as the soup is cooked and served unseasoned. As you can see, there are a lot of things in the photo that were not included in my initial description of samgyetang. TSC stuffs their chickens with not only sweet rice and ginseng, but also whole garlic cloves, dates, and chestnuts. The dish is topped with scallion, sunflower seeds, pumpkin seeds, and pine nuts. I love the extra ingredients that TSC incorporates in their version because you can taste all the flavors in the chicken ginseng broth. The garlic cloves add depth, the dates add the tiniest hint of sweetness, and the chestnuts add a little nuttiness to the overall flavor. All these can be found inside the chicken when you tear it apart, and everything should be eaten. They give you a small tin bucket for you to discard your bones as you go along. The sunflower and pumpkin seeds add great crunchy texture to keep you sated while you work on separating your chicken from its bone. Biting into the seeds add little bursts of nutty flavor that only add to the party of flavors in the broth, and they’re actually my favorite part of the TSC experience. The broth is definitely not as thick, though the standard samgyetang is still pretty tasty on its own. However, I do have 2 suggestions to help make the most of your TSC experience. First, don’t take too long to eat it, because cold thick broth is no bueno. A good method of consumption is by tearing open the chicken, focusing on eating all the meat first, then enjoying the stuffings and broth. Second, don’t go when there aren’t many customers. The kitchen pumps these babies out in large quantities, and if it’s not the middle of a lunch or dinner rush, they have the tendency to make more samgyetang than there are guests. Which means the samgyetang sits for a bit, before being reheated and brought to the customer, and as I said before, cold, thick broth is no bueno. Reheated is still ok I guess, but fresh is best.